The 20 year time-span of 1965-1985, was classic Santa Fe. Having Charles Smiley Presents, this era on Santa Fe, promises an entertaining program. First and second generation locomotives from the major diesel builders will give us a highly engaging variety of action. The multiple film sources provide an unending array of viewpoints. Many locations showcase the Santa Fe in all types of environments. This show has a high percentage of train action. Aerial views are sometimes employed. Note the long running time of the show. The extra length will be needed to have such excellent coverage of the 20+ years. Newer video from 1993 is included. Older film is also used to round out the story. A wealth of historical information is shared. The Santa Fe has a long and rich history. The locomotive builders each have unique backgrounds. Charles will even segue into another railroad, with film, as diesel models are discussed. All of the source films have been digitally remastered. These are the best possible images from the original reels. Professional editing will tie the multitude of scenes together in one large tapestry. Generous usage of on-screen graphics, the viewer will keep location aware at all times. A chapter menu is handy to have. Alco power has a feature on the famous PA1 series. 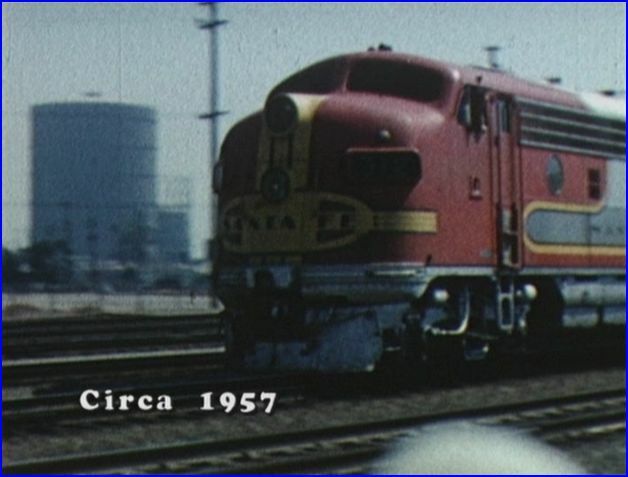 In service views remind us of what a stunning looking piece of machinery a PA was in the Warbonnet scheme.Updated to show the ex:ATSF in D&H paint, operating in Mexico. 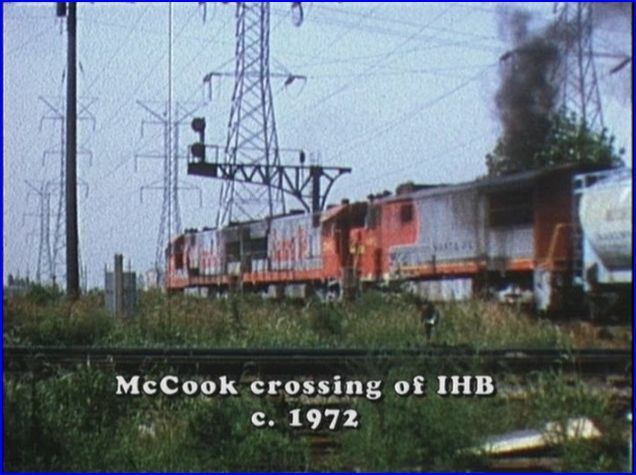 Alco roadswitchers continue the Alco story. RS1, RSD15, RSD5, RS3 units. Switchers S2 and S4’s are viewed. The F7 red and silver power sets are the most recognizable face of Santa Fe. The shiny passenger warbonnet scheme get plenty of time in this show. Passenger trains get balanced coverage. Eventual demise and subsequent conversion to CF7’s close the F7. EMD has many of its model examined on the Santa Fe. 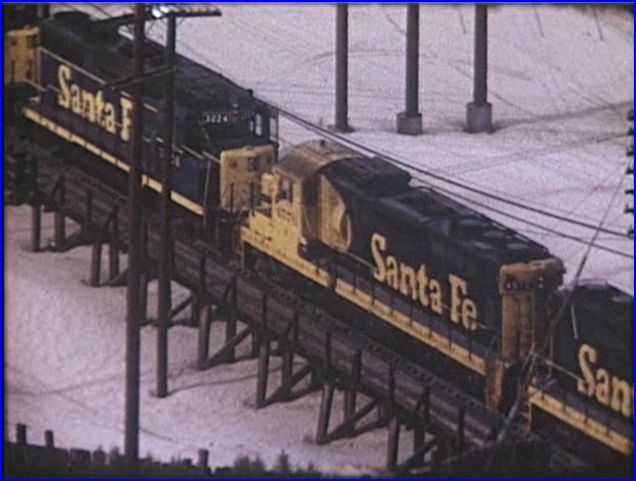 Much of the footage has blue/ yellow pinstripe paint lashups. SD24 and conversions to SD26. GP20, GP30 and GP35 units are covered. 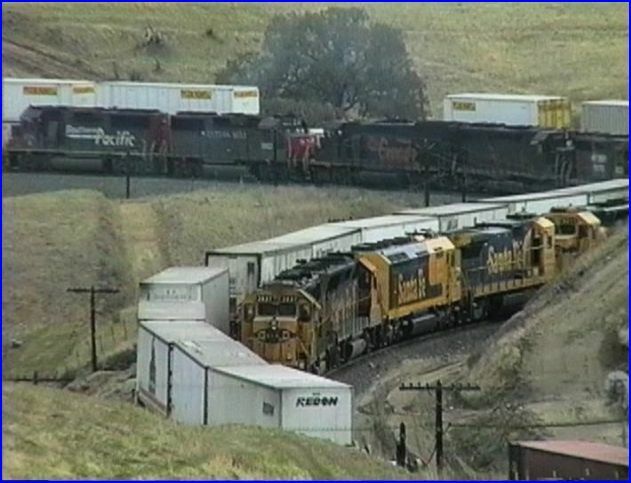 GP7’s and SD39’s are seen. SD40, SD45 and ensuing dash 2 updated models. 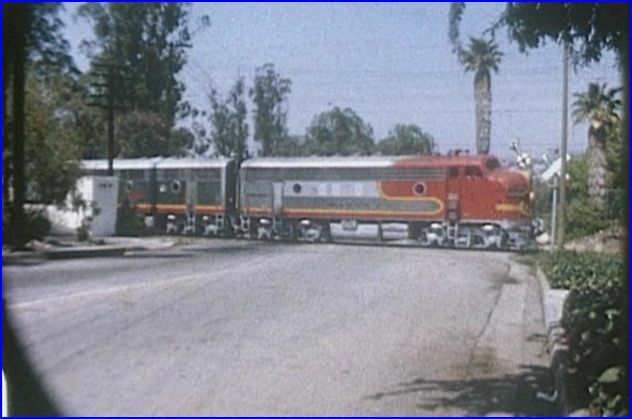 Bicentennial SD45-2 units are viewed. 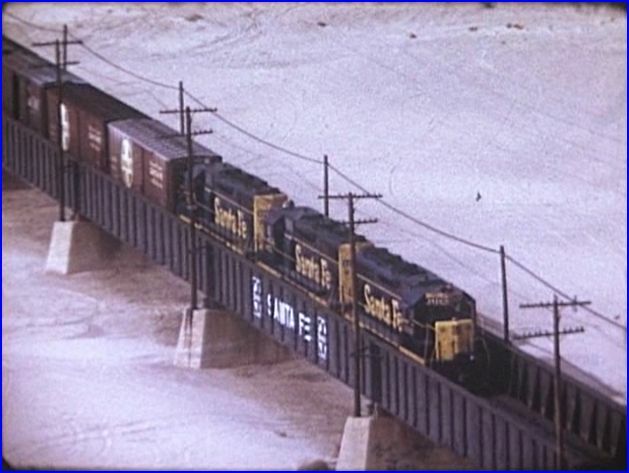 Union Pacific, Southern Pacific, Western Pacific and Utah Railway all make cameo appearances, as the story unfolds. There are numerous vintage freight cars on parade. Model railroaders will get some good looks at consists and weathering. Cabooses are as common here, as they once were. 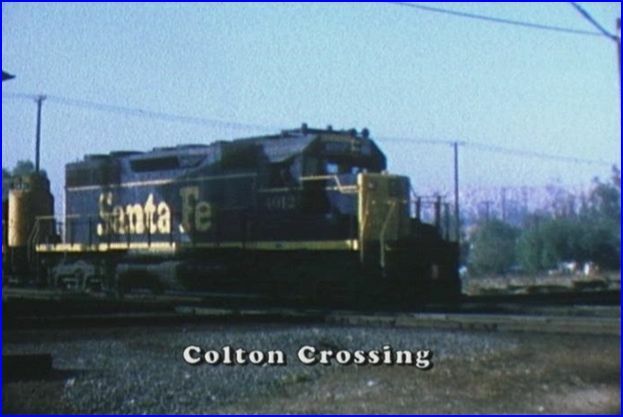 The old, brown ATSF lettered cabooses and modern red, holy cross schemes appear on the standard Santa Fe cupola style equipment. 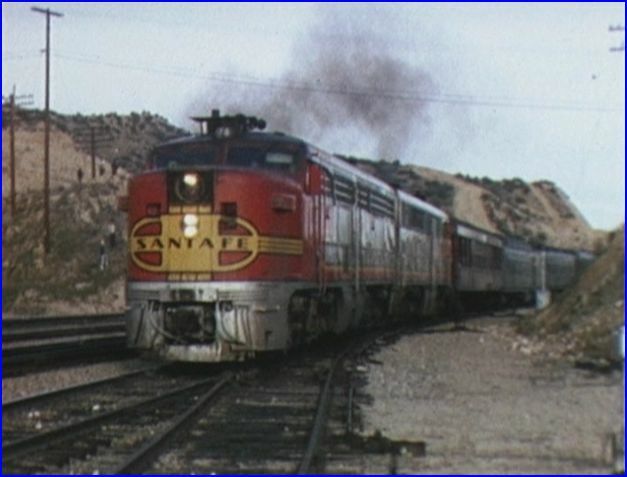 FP45’s introduced in 1967, revitalized the famous warbonnet look. Charles Smiley always includes the labor intensive, hand drawn maps. A single custom map, can consume an entire workday to create. Clarity, is what a CSP program provides on all shows. Location maps, elevation maps, overviews by states, routes, and street map close-ups. Whatever is required, is produced. At times, complicated trackage, with other railroads intersecting or overlapping lines is better explained with these visual aids. The attention that is paid to keeping the viewer informed on locations, enhances the viewing pleasure. This level of high quality is the Charles Smiley standard of production, in all areas of his train video programs. The F45 is another EMD model that is looked at. The FP45 conversion to freight service too. 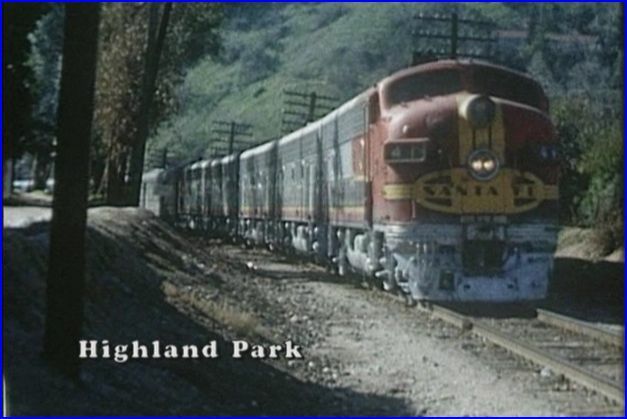 All of the locomotive segments include great action and plenty of trains. The Super C is a natural extension of the large cowl body diesels. 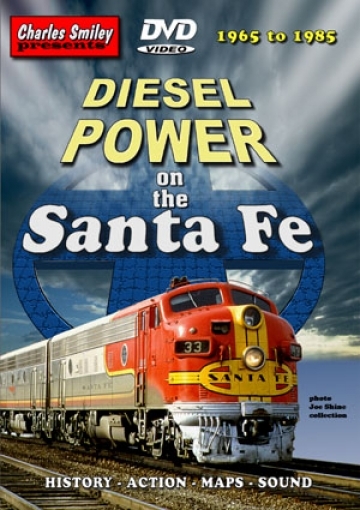 General Electric is another chapter in Santa Fe diesel power. 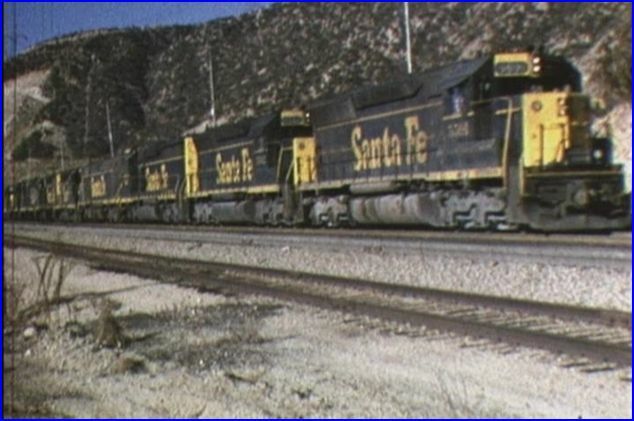 The 1960’s saw U25B locomotives enter service. U33 and U36C models continue the tale. SF30C rebuilds were a successful update of the U36C. Enter a kodachrome unit here! Charles does whatever it takes, as he covers any railroad. Film from the 1950’s to 1990’s, reaches outside of the timeframe. Comprehensive coverage is the action! Techachapi Loop gets a special, featured location chapter. Modern era yellow warbonnets are the dominant power. Older paint, in earlier times is also seen. Helpers are shown here, and at Cajon Pass. Cajon subdivision also has a fascinating feature visit. The maps are nice to have, explaining the mountain trackage. 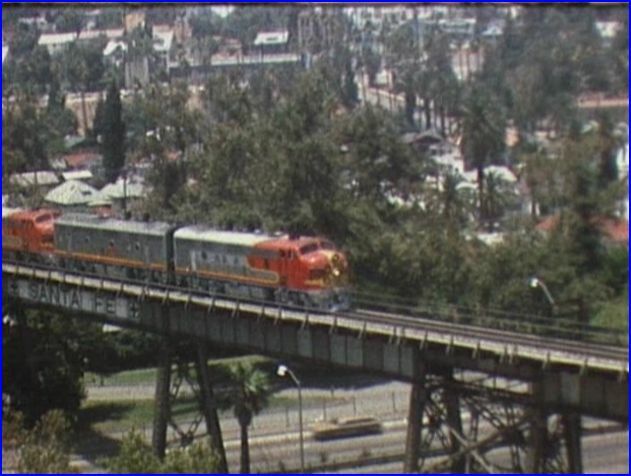 As with the rest of this show, even more spectacular vintage views of ATSF freight trains. Throw in some Union Pacific on trackage rights. There is much more to see in this show. Mojave and Barstow Yard are additional highlights. The Pasedena sub is a great looking line that says, California. Colton Crossing is another cool highlight. 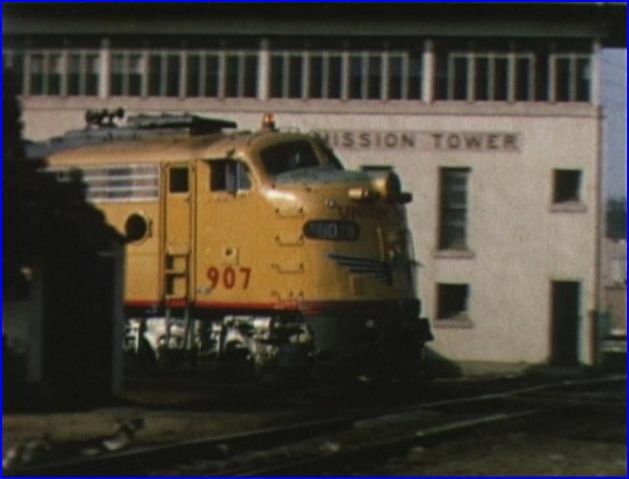 Southern Pacific and Union Pacific cross at the former tower. Stockton Tower is viewed, with some intersecting lines there. Fresno street running, gets a brief look. This is a must see program for the Santa Fe fan. Anyone with interest in this classic era would find much appealing footage in this show. It will standup to repeated screenings. The cornucopia of scenes will need the repeats to truly see everything that is included. Diesel Power on the Santa Fe is a highly enjoyable program. A vintage train enthusiasts dream. Everything that you want to see and so finely presented. The combination of vintage era Santa Fe and Charles Smiley Presents, has given us a truly outstanding program that is beyond classic! 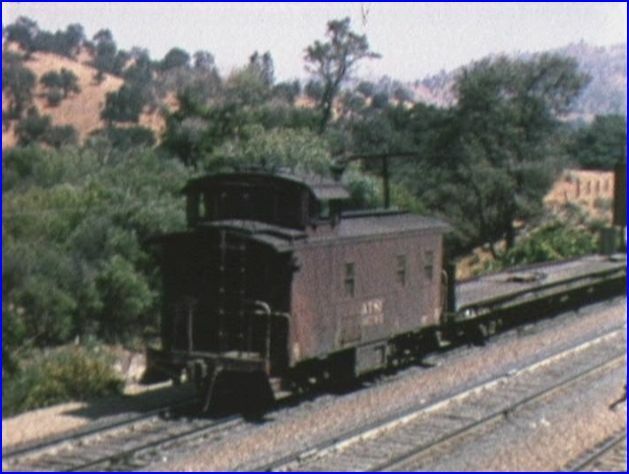 This entry was posted in ATVR Reviews, Charles Smiley Presents and tagged American Train Video Reviews, California, Railroad, Santa Fe, Train DVD, transportation, Western Pacific by William J. Hudson. Bookmark the permalink.